Series registration is no longer available. Series registration also includes the Arboretum Research Symposium, a free event. Registration for individual lectures closes the Monday before the event. Space is limited for this popular program and some lectures may fill during advanced registration. If space permits, day-of registration is on-site only, paid by cash or check. If a lecture fills during advance registration, walk-ins will not be accepted. Preregistration is strongly recommended. Please arrive early and carpool, as parking is limited. 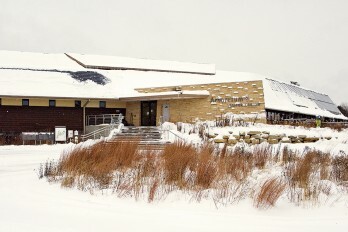 Since 1968, the Arboretum has offered lectures for naturalists in the greater Madison area. This winter naturalist program is also open to Arboretum volunteers, friends, and interested public as space allows. Advance registration is recommended for this popular program. Walk-ins will not be accepted if a program fills by the registration deadline. Use the links below to register. Please register for each individual lecture separately. Note: The January 24 (Using Birds to Understand How Nature Works), January 31 (Seed Sourcing for Habitat Restoration), and February 21 (Immobile Yet Responsive—How Trees Interact with Their Environment) lectures have sold out. Series registration is no longer available. The 2019 series will begin January 10 and continue through March 14. Lectures are on Thursday mornings from 9 to 11:30 a.m. in the Arboretum Visitor Center auditorium. Bring your own reusable mug for coffee, available starting at 8:30; programs will begin promptly at 9. January 10, In Defense of Public Lands: The Case Against Privatization and Transfer. Steven Davis, professor of political science, Edgewood College. Registration closed. January 17, Using Soundscapes to Understand How Nature Works. Bryan Pijanowski, professor and University Scholar, Department of Forestry and Natural Resources, Purdue University, and director, Center for Global Soundscapes, Purdue University. Registration closed. January 24, Using Birds to Conserve Landscapes Worldwide. Jeb Barzen, ecologist, Private Lands Conservation LLC. Lecture is sold out. January 31, Seed Sourcing for Habitat Restoration. Rescheduled, see March 14. February 7, Can Evolutionary Biology Help Us Restore Prairies? Andrew Hipp, senior scientist in plant systematics and herbarium curator, The Morton Arboretum. Registration closed. February 21, Immobile Yet Responsive—How Trees Interact with Their Environment. Kate McCulloh, assistant professor, Department of Botany, UW–Madison. Lecture is sold out. February 28, Action on Climate Change—The Largest Health Intervention of the Twenty-First Century. Jonathan Patz, director, Global Health Institute, UW–Madison. Lecture is sold out. March 7, 50 Years of the Wisconsin Wetlands Association. Tracy Hames, executive director, Wisconsin Wetlands Association. Register by March 4. March 14, Seed Sourcing for Habitat Restoration. Keynote: Laura Jackson, Director, Tallgrass Prairie Center. Discussion panel: Amy Alstad, land protection associate, Driftless Area Land Conservancy; Corrine Daniels, director, Nursery Operations, Taylor Creek Restoration Nursery; Rich Henderson, board member, The Prairie Enthusiasts; and Kevin Kawula, owner, Lone Rock Nursery. Lecture is sold out. Rescheduled from January 31. March 21, Native Plant Gardens at the Arboretum: Then and Now. Susan Carpenter, Native Plant Gardener, UW Arboretum. Register by March 18. Rescheduled from March 14.